Metro Center Executive Director Dr. David E. Kirkland and Deputy Director Norm Fruchter won a successful bid from the New York City Council to establish the NYC Alliance for School Integration and Desegregation (ASID). The ASID initiative is intended to address the systemic and gross inequity in the New York City Public School system. Over the past three years, advocates, educators, and legislators have begun to address this systemic and gross inequity through ASID by bringing advocates and experts together to share their work and find solutions to this problem. Despite its extraordinary overall diversity, New York City has one of the most segregated school systems in the country (as shown in a 2014 study by the UCLA's Civil Rights Project), and in fact that segregation has actually worsened across the past forty years. In more than half of the city's 1,600 public schools, Black and Latino students comprise at least 90 percent of the student population of more than half the city's schools, and more than half of the city's thirty-two community school districts are similarly hyper-segregated. Meanwhile, half the city's white students are concentrated in just 7 percent of the city's schools, and half the city's Asian students are concentrated in just 6 percent of schools. The typical black and Latino student attends school where nearly 70% of the students are low-income, whereas only 29% of the typical white student's classmates are low-income. What results is consistent and stark educational inequity. Services will be provided through a variety of NYU venues and other workspaces across the city where the members and member groups of ASID come together for project work. The award was granted by speaker Melissa Mark-Viverito of the NYC City Council, on behalf of herself and fellow Council members Dromm, Ferreras-Copeland, Lander, Levin, Levine, Menchaca, Rosenthal, and Torres. 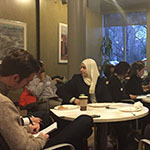 In year 2016, NYU Metro Center received an earlier grant to pilot the NYU Metro Resource Center for School Diversity, which supports efforts to integrate public schools in New York City through technical assistance, research, and strategic support for organizing. For 39 years, the Metro Center has been a transformational force inspiring positive change in schools, districts, and regions across the country. The Metro Center is powerfully focused on driving equity and access in urban, suburban, and rural school settings - especially when confronting issues of race, gender, and national origin. Persistence of vision has forged the Metro Center into a nationally recognized leader in educational equity. Its comprehensive programs serve a wide range of constituencies - more than 5,000 classroom staff impacting 125,000 students, as well as 2,800 parents and 61 agencies, schools, and school districts. Metro Center seeks to continually expand and evolve its services.